Jewish enrichment where your kids won’t want to miss a day! An innovative program where the joys and traditions of Judaism are brought to life. Students learn and experience a wide spectrum of Judaic knowledge and Hebrew through stories, art, drama and music. "A school that starts at the beginning, an education that never ends…"
We are currently accepting application forms for the 2018-2019 school year. Please fill out ALL fields of this form. If you have any questions or concerns you'd like to discuss with us, please call 818-718-0777. CONFIDENTIAL: Does your child have any allergies or other medical condition we should be aware of? If yes, please describe them and indicate special precautions or care needed. 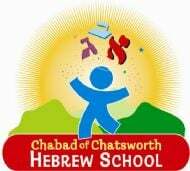 The following is a tuition agreement for the Chabad of Chatsworth Hebrew School. The agreement explains the tuition fees, payments plans and refund policies. Please read it through carefully. If paying by check or cash, full payment must be submitted to the school office before any child will be permitted to attend classes. Plan A: Pay the entire amount in full with a check, cash or credit card. Plan C: Pay the tuition on a monthly basis with a credit card. Your credit card will be billed monthly from September through May. To do so please include your credit card information below.